Sore throat can be a first sign of upcoming cold, strep throat or underlying gastroesophageal reflux disease. Symptoms of sore throat include dryness of throat, swollen glands in the throat, hoarseness of voice and white patches on the tonsils. Sore throat affects people of all ages but it is more prevalent among children, people with allergies, smokers and those with a weak immune system. Sore throat can be treated using natural ingredients such as garlic. Is Garlic Good for Sore Throat? Active ingredient Allicin present in garlic kills the bacteria or virus causing sore throat. Garlic has potent immune-stimulating effects that prepare the body to fight and heal infections causing sore throat. The natural oils in garlic provide decongestant and expectorant effects that help to break down and expel the mucus causing irritation in the throat. It also provides relief from pain and irritation. 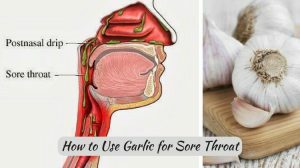 How to Use Garlic for Sore Throat? Below are the best home remedies for treating sore throat using garlic. You can try any of them regularly to get relief. Take 2 to 3 cloves of fresh garlic. Leave it aside for 10 minutes. The oxidation helps the garlic to release more amounts of allicin. Consume it with a glass of water. Repeat this remedy 1 to 2 times a day. You can also chew on garlic cloves throughout the day to relieve strep throat. Peel 3 to 4 cloves of garlic and mince them finely. Leave them on the chopping board for 10 minutes. Now boil a cup of water and add the minced garlic to the boiled water. Let the garlic steep for 5 minutes and then drink the tea. You can have 2 to 3 cups of garlic tea per day until you get complete relief. Note: you can use garlic powder instead of fresh garlic. Alternative: If you don’t like consuming it, then you can use garlic tea to gargle. Boil 1 liter of water and pour it into a pot. Add a few drops of garlic oil to it. Inhale the steam for 10 minutes. Repeat this remedy once in a day. The anti-inflammatory properties of honey reduce inflammation, swelling and soothe irritation. Enzyme glucose-oxidase found in honey fights against infections. Crush 3 to 4 cloves of garlic to make a paste. Add it to 1 tablespoon of honey and stir it. Consume this syrup 2 times a day till throat irritation heals completely. The acids in lemon break up excess accumulated mucus. It also soothes the pain and inflammation caused by the infection. The natural antiseptic properties of lemon destroy the bacteria and virus that cause throat infection. Add a tablespoon each of fresh garlic juice and lemon juice to it. Mix well and drink it up slowly. Drink this concoction 2 to 3 times per day to cure sore throat. Warm milk provides a soothing and relaxing effect on your throat which is useful for treating dry or raw sore throat. Get a cup of lukewarm milk. Add a teaspoon of crushed garlic to it and mix well. Drink it up before going to bed. Repeat this remedy once every night to get relief. The high acidic level of apple cider vinegar kills the bacteria responsible for throat infection and sore throat. Add 1 tablespoon of apple cider vinegar and 1 teaspoon of crushed garlic to a cup of warm water. Drink this concoction at least 2 times a day for a couple of days. Make sure to use only raw, unfiltered apple cider vinegar for this remedy. The anti-viral and anti-inflammatory properties for licorice root helps to provide a relief from swelling and irritation. This combination also soothes the mucus membranes in the throat. Add a teaspoon of dry licorice root to it. Strain, add a teaspoon of fresh garlic paste to it and drink the tea. You can have 2 to 3 cups of this tea per day until you get complete relief. Olive oil coats the irritated walls of the throat and soothes the itchiness in the throat. Its anti-inflammatory components help to reduce inflammation of the tissues in the throat. Warm some extra virgin olive oil. Add few crushed garlic cloves to it. Let the garlic steep in the oil for 10 minutes. Strain the oil, let it cool a bit. Consume 1 tablespoon of the oil once in every 2 to 3 hours in a day. The anti-inflammatory and anti-bacterial properties of ginger help to heal inflammation and kill infection-causing bacteria, thereby healing sore throat. Crush 2 to 3 cloves of garlic and 1 inch of ginger to make a paste. Consume 1 teaspoon of this paste with some water. Repeat it 1 to 2 times daily till throat infection is completely healed. The anti-bacterial properties of baking soda kill the infection-causing bacteria. It balances the pH levels which soothe the swollen and inflamed tissues in the throat. Add 1/2 teaspoon of baking soda and 1 teaspoon of crushed garlic into it. Mix it well using a spoon so that the baking soda dissolves completely. Take a sip of the liquid and gargle with it. Repeat it 2 to 3 times a day for few days. Cloves contain eugenol which makes it an effective natural pain-killer and anti-bacterial agent. It helps to reduce soreness of the throat and heals the infection at the same time. Take a glass of boiling water. Add 5 to 8 cloves to it. Let the cloves steep in the water for a few hours. Strain the water, add a teaspoon of garlic paste to it and drink it up. Excessive consumption of garlic may cause body odor, bad breath, mouth irritation and indigestion. In rare cases, garlic might cause side effects such as rash or hives. Garlic might interfere with certain medications such as blood thinners, so consult your doctor before trying the treatments. Allicin found in garlic is activated only when garlic is crushed and kept in the open air for some time. Garlic acts as blood thinner, pregnant women should refrain from using garlic as mode or treatment for any health condition. Dehydration can worsen sore throat. So, make sure to drink plenty of liquids to reduce throat irritation. Use a vaporizer or humidifier in the bedroom to soothe the swollen and inflamed air passages. So, try out these natural remedies for sore throat with some patience and consistency. Don’t forget to share your experiences, queries and tips with us in the comments section below.